Everybody likes to know how they are doing. That especially applies to business. They can’t really be successful unless they know how their customers react to their service. The best way that a business stays in operation is through positive word-of-mouth. Based on the reviews that Junk King Albany receives it’s clear they’re going to be around for a very long time! Here are a few recent postings. It might have taken you years to accumulate all the stuff in your house but it won’t take Junk King Albany very long to get it all cleared out. The two-man moving crew assigned to your task will move very fast to make sure you get back to your day without all of your junk. Junk King Albany has a pricing policy that is based strictly on volume and not weight. You’ll never be charged by the pound with them. That will make a huge difference when you decide what you want to get rid of. In other words, anything goes whether that’s just an old computer or pile of concrete! You should never move into a new home carry in your old junk. One call to Junk King Albany make sure your home becomes junk free. This entry was posted in junk removal and tagged Junk King, junk removal, reviews on October 31, 2016 by Todd Porter. Last updated August 16, 2017 . 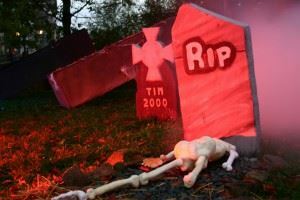 As you go through your neighborhood, you’ll start to see all kinds of ghoulish pumpkins, giant spiders, hanging ghosts and fake tombstones popping up on front lawns. Everyone is getting into the holiday decorating spirit. Putting out decorations on your front lawn for Halloween is a good way to show trick-or-treaters that they are welcome there. It’s also fun to get some “scares” going on. The worst thing would be if someone mistook your home for a haunted house when you didn’t even put up any decorations. If your front lawn is looking a bit shabby, then it’s time to bring in Junk King Albany. Junk King Albany is all about giving your home a makeover. That can start with putting the two-man crew assigned to your task to work around the yard. Although they specialize in removing bulky objects like furniture and kitchen appliances, the Junk King Albany crew can also do some amazing things when it comes to clearing up the yard. They can take away any fallen tree branches, dead shrubs, old tires, broken planters, rotting fence or any other yard debris. Once all of that rubbish is cleared away, you’ll have a better chance to see what you’re working with in terms of improving your curb appeal. It’s not too late to bring in some perennials to spruce up your front lawn. 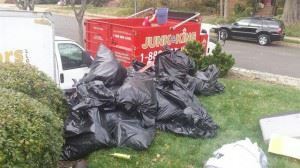 When they’re finished clearing out all the junk in your yard the Junk King Albany crew can set their sights to clearing out the junk around the rest of your house. Your garage, basement and attic don’t have to be haunted with junk. Anything and everything can be removed very quickly by that Junk King Albany crew. The cost for all of this hard work won’t scare you. Junk King Albany charges a flat rate based upon how much space your junk is going to fill the back of the truck. One fee covers all the labor, transportation and disposal. Shop around your sure to see that Junk King Albany offers the best deal in town for this type of service. When Junk King Albany takes away your unwanted rubbish it’s definitely a treat and not a trick! This entry was posted in junk removal and tagged Halloween, jjunk King, junk removal on October 22, 2016 by Todd Porter. Last updated August 16, 2017 .